For those of you who were personally affected by the damages caused by Hurricane Harvey, the Gulf Coast Veterinary Specialists team would like to extend its heartfelt sympathy as you navigate the rebuilding process. As many of you have heard, we experienced significant damage at our 1111 West Loop location and it has remains closed since the storm. The good news is that we have been working hard to support our clients and patients by moving our emergency team to our 3800 Southwest Freeway location and have also been seeing patients and performing procedures for many of our other specialties. 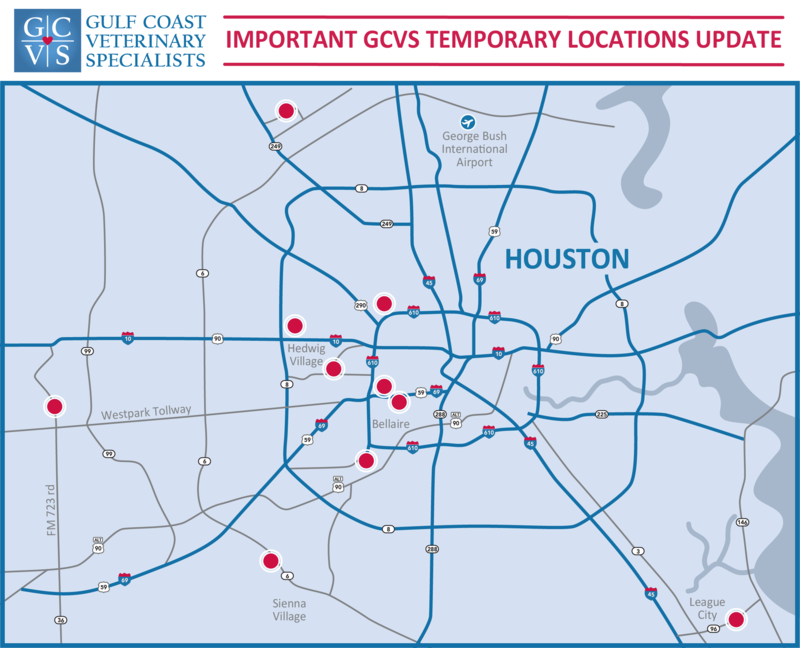 Our next phase of rebuilding involves stationing our specialists at nine different veterinary hospitals throughout the Houston area so they can increase their ability to diagnose and treat patients even further. While we view this to be a temporary solution, we are very grateful for the hospitals that have graciously allowed us to use their space to independently run our services out of their facilities. Click here for more information about where to find specific specialties and services, how to make appointments, and how to request prescription refills. Please stay tuned for more information as we continue our rebuilding process, as we will have more exciting news to come in the upcoming weeks. Thank you for your patience and trust in GCVS!